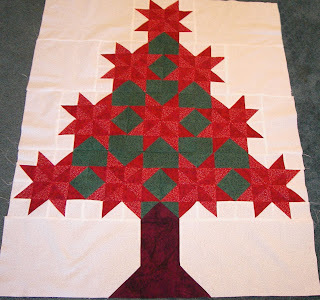 After searching several different stores for "just the right" decorations for my Christmas Tree Quilt wall hanging, here is what I have found and will be adding this weekend. B - I found the cutest miniature ornaments at Wal-Mart. Each card had 4 miniature resin ornaments and they were $1 for each card. C - Is miniature silver snowflake garland to wrap around the visible part of the tree. D - Is thin silver metallic cording I plan on using to "tie quilt" the tree part while also securing the miniature ornaments for B. It will be interesting to see how these will come together on the tree. I'll test out the layout first before securing everything just to make sure it's not too gaudy. 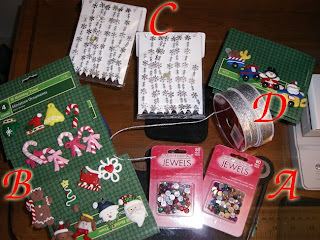 Heck, with all this, I'm going to need some serious loops to hang the Christmas Tree wall hanging.